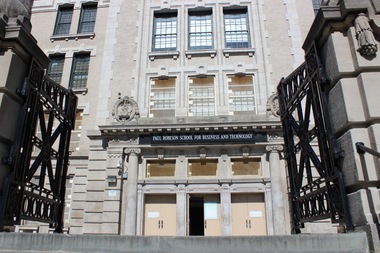 The P-TECH High School in the former Paul Robeson High School building on Albany Avenue in Crown Heights has had zero dropouts over four years, according to DOE graduation rates released Monday. CROWN HEIGHTS — Seven out of ten students at neighborhood high schools earned a four-year diploma last year, the Department of Education announced Monday, the highest average graduation rate in the district since the agency began tracking the data. Within District 17, which covers Crown Heights, Prospect-Lefferts Gardens and parts of Brownsville and Flatbush, 1,449 out of 2,065 students in the Class of 2015 graduated, or 70.2 percent, DOE records show. That rate topped the six previous high school classes in the district since the DOE began tracking in-depth graduation rates starting with the Class of 2009. Rates at specific schools within District 17 varied considerably. At the Science, Technology and Research Early College High School within the Erasmus High School campus in Flatbush, 97.2 percent or 69 out of 71 seniors graduated last year — the highest rate in the district, the DOE said, and no students dropped out; the two that did not receive a diploma are still enrolled. The graduation rate at Medgar Evers College Preparatory School in Crown Heights was a close second at 96.3 percent; of the schools 219 seniors last year, 211 of them earned a diploma. More than two thirds of the 21 high schools in District 17 graduated more than 60 percent of their seniors last year or had too few students to be included in the data, the DOE said, but two in particular fell well below the rest. The W.E.B. DuBois Academic High School, also in Crown Heights, gave a diploma to only five of its 50 seniors last year, a 10 percent graduation rate; in the previous six years, the school has had graduation rates between 8.3 and 23.7 percent. And at the Brownsville Academy High School, 23 out of 80, or 28.8 percent, of seniors graduated last year; in previous years, graduation rates at the school fluctuated between 12 and 33.7 percent, the data shows. Overall, the DOE cheered the high graduation rates as the data was released on Monday, with Schools Chancellor Carmen Farina saying the numbers represent "important progress." But the DOE data shows that the percentage of students meeting state and city college readiness standards in the Class of 2015 grew. Citywide, 42.6 percent of students last year received a score of 80 or higher on the math Regents and a 75 or higher on the English Regents, up from 3.2 percentage points the year before. And just over 49 percent of high school seniors met the "College Readiness Index" — a measure of SAT and ACT scores — which was a 1.8 percentage point increase from the Class of 2014.